Corner Wines is the sole distributor of custom wine cabinets which are made in Texas. The cabinets range in size from 150 – 500 bottles. Our furniture-style, all-wood wine cabinets are intended for the wine lover who wants to enjoy the functional aspects of a wine cellar while blending the design into their living environment. These refrigerated wine cabinets are made from wood from the USA and can blend in or stand out as the star in your decor whether Traditional, Contemporary or somewhat in-between. You make that selection. Our customers love the fact that the refrigerated wine cabinet blends beautifully with their furniture in any room in the house. The cabinet maker can add additional cabinetry to match the wine cabinet. The choices are endless. When you order your wine cabinet, you select the wood stain, hardware and type of wooden shelves you want. 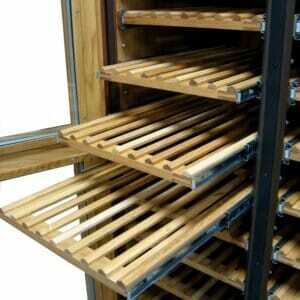 Power Glide™ Storage Racks will keep your wines within easy reach. The solid White Oak pull-out racks provide a smooth ride for your precious cargo on full extension 100lb weight-rated, ball-bearing slides. There is no reaching in and digging for bottles; labels and hands remain unscratched. A variety in wine bottle sizes is easily accommodated with our unique tool-free rack spacing adjustment. Your wine is elegantly stored, whatever the size of the bottle, Magnum, Standard, or Demi-sized.